Without turning my blog into some kid of shrine for my recently departed Nan I did want to share something that was discovered as we have been clearing my Nan's house. It won't mean much to many people but for me and my family it has special significance, we assume my Nan had planned to read the following at my wedding but on the day she was very tired as she was caring for my Grandad at the time and his alzheimers was progressing fast, for whatever reason she did not read it at the time nor did she give it to me while she was alive. I want to write one more blog in tribute to my wonderful Nan but in the meantime I hope you enjoy reading this. For Sid and Sam 6th May 2006. My most vivid and lovely memory of Samantha is when she came to stay for a few weeks when her mother Lesley was not too well. I had promised to take her to across the field to a little general store. Overnight we had a heavy fall of snow about 4 inches which meant that Sam would have to wear wellies. However she did not have any. I thought it was a shame to disappoint her, so I came up with the idea of using 2 M and S carrier bags which were tied over her shoes with some string. The M and S carrier bags were stronger than they are now. We set across the field and returned home, the bags were still in tact and her feet were warm and hot when we removed them. I have since watched Samantha grow into the lovely girl she is today, credit for this must go to her mother Lesley who brought her up with family values, to be loving and kind, loving and with respect for everyone and lastly to be true to herself. Samantha is very determined and one thing we all knew was that she would never get married. In fact marriage was almost a taboo subject. That was until Sid appeared on the scene and they announced their engagement. Both Lesley and I were more than surprised. Sid must have been a very special man to change Sam's mind, he must have endeared himself to her, in fact their love of one another is very evident. As one of Sam's side of the family we really welcome him into our midst. It's great for me to have a new grandson-in-law, in fact my first and he is also enlarging the family. Family is the key word and to have one in good and bad times makes such a difference. 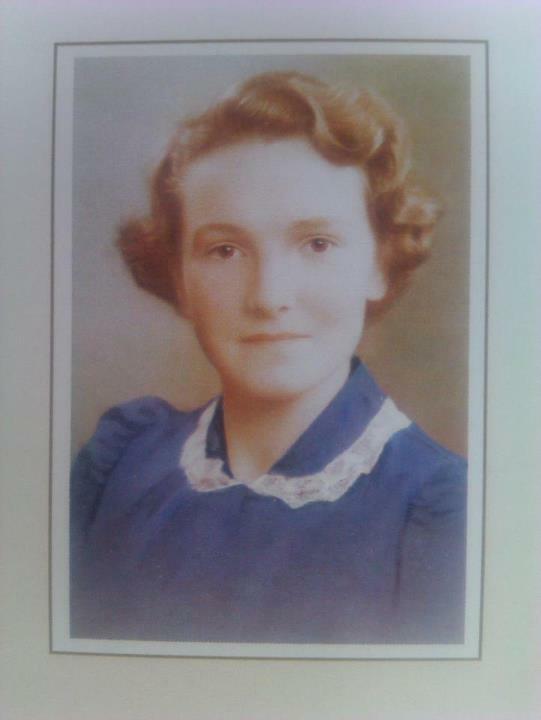 To illustrate this - Last year (2005) I was introduced to Flo, Sid's mother, on a visit to Plymouth. Shortly after I was on holiday in Blackpool with David, my husband, and Eric, my brother. On arrival I had a bad fall and ended up in hospital for an operation on my hip. Eric and David would visit me in the evenings but mornings and afternoons were awful. I knew no one, was in a different place, miles away from home. This particular day I was feeling very low and very sorry for myself when visitors started to arrive and went to various patients beds. I was quite taken aback when 2 ladies entered the ward and came over to my bed. The leading lady approached me and said "Hello Eileen, I am sure you won't recognise me?" In a flash I replied "Oh yes I do, it's Flo" I was the introduced to Leslie, her daughter, who had driven her over from Bradford. I can only assume that Flo had been contacted by Sid and that Flo decided to visit me, Leslie of course was also involved too. So that is just a small illustration how family can be supportive in bad times. Today is a very big family day when both family and friends have come together to witness Sid and Sam making a commitment to one another. A really important family day. It's also a proud day for me to have my 2 other granddaughters here today, Valerie from Kentucky, USA - she and Sam have always been very close - and Bethany my youngest grand daughter who is one of Sam's bridesmaids. Finally we would like to wish Sam and Sid many happy years of marriage and I hope they reach their Diamond Wedding as their Grandmother an Grandfather have. The family will always be there for you both, we love you both very much.